John Bauer Ceramic and Porcelain Art - Blog - By Golly Plates! Plates, plates, plates, oh how they make you weep. They crack in the making process, they crack in the firing process, they crack when you turn your back and you are not sure exactly when the crack creep in, but there it is. Porcelain is not suited to plate making. Porcelain is piroplastic at its highest temperature and therefore the plate will change shape in the kiln, it will relax. So you will have to anticipate for this, and make the plate far deeper than you are wanting it to be at the end. This is porcelain memory, it remembers its original state and at high temperatures it tries to move back into a previous shape that it once was. This is very complected for me as a designer. I do not like it, I do not like it at all. Thus, what I like to do is not make plates. 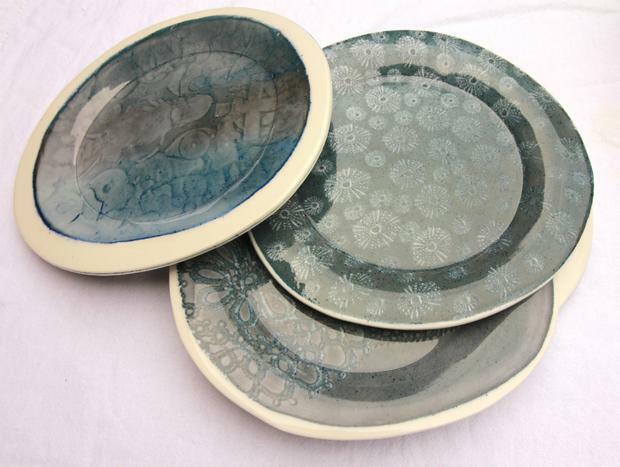 The trouble with not making plates, is the fact that plates are rather popular, far more popular than I would like. I have made over twelve and a half thousand bowls. I absolutely love making bowls, porcelain wants to be a bowl. It looks at me and it screams “make me into a bowl”, it begs and says, “no not a plate” and normally it gets its way and I make a bowl, and I am very happy with my bowl. But some days there is the challenge and you look at it and say, “No not today, today you will not be a bowl, you will be a plate.” Those days are the days that I grow creativity. I can experiment with surface and design in ways I can not on a bowl. I use to charge far less for a plate than I did for a bowl. The reason for this is because, I believed the plates were crap. However when I look back at photographs of these plates I think, no, I was delusional, these plates are flipping marvelous. And so, often it is, as change, causes the mind to rebel, so to, looking at a new work out of the kiln, freshly changed from how you made it you despair and say to yourself, “this is no good”. It is only the managing your expectations as a designer that you can tap in to what is really happening. The fruit of hard work is a necessary, forcing the medium to do exactly what you want. It is the tango between the medium and you. Sometimes it takes a step, sometimes you take a step. But greatness is achieved when the medium take a step, and when that step is a nodal step, a marvelous step a step to be celebrated. And thus, I came to the conclusion that these plates, although in my first estimation were absolutely no good. By having had the time to forget my expectation on how they should look. As time washes away everything eventually. Looking at them objectively, I think to myself, “By golly, these are masterpieces”, although I don’t make many and I struggle with them, these are masterpieces. And thus I have decided, that these should not be discounted comparatively to my bowls. They should just stand next to the bowl as equal. Exposition composing administrations live in light of market powers. It is likewise approved, and paper composing administrations are similarly as secured as some other true blue world business. On the off chance that you need to utilize essayists for Classwork, please check every single accessible audit about them. Google Gravity is a java script-based search engine trick that Google programmed in 2009. The original method for activating it may not work on your computer, because of changes to Google’s reprogrammed search page and automatic results. If so, you can access Google Gravity through a special link. Have you ever seen your web pages turn upside down or might seem like falling down? In the Google Gravity tricks, you can find all such amazing and cool stuff. The content of web page are related to gravitational pull and they commence acting adversely. Google Gravity comprises a plenty of entertaining stuff which probably tends to baffle anyone with its mind blowing ideas. With Gravity google, you can easily confuse anyone and make their time worth spending in something insane and unique.